First it was cadmium in toys, one of the top stories at the beginning of this year. Also, just recently in May, Walmart recalled Miley Cyrus Jewelry because of cadmium. 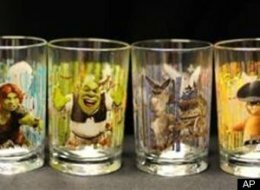 Now McDonalds is recalling Shrek Glasses because of cadmium in the paint. Preliminary tests have been performed by a friend of mine, TheSmartMama and she posted her results on her website. She does a great job of explaining where the cadmium comes from and what the levels mean. Check out her site. Midwest Laboratories uses the same XRF Technology to run a preliminary detection of elements. In addition, a leaching method is used to determine how much of the cadmium comes off of the particular product. With Cadmium recalls being in the news more frequently, people should be more informed as to what the levels mean and where they may be exposed to the element.